School starts at 8:25 and dismisses at 3:50 p.m. There is no adult supervision available for students until 8:00 AM unless you participate in Latchkey services. Students arriving to school prior to 8:10 AM should enter the front doors and go to the gym. Pre-K meets daily. AM classes are from 8:25 AM - 11:25 AM and PM classes are from 12:50 PM - 3:50 PM. To ensure the safety of our school children, everyone must sign in at the office and get a visitor's pass. Please park in the marked parking spaces, the circle drive is for busses only. At the end of the day, please wait at the front entrace for your child to be released. Latchkey services are available beginning at 6:30 AM - 6:00 PM. Information is available through the Haysville Activity Center. Please remember to call the office when your child will not be in school because of illness or appointments by 9:00 AM. Our phone number is 554-2281. 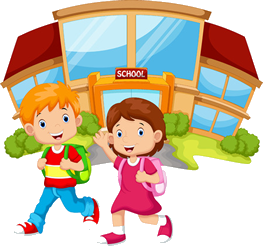 If your child arrives at school after 8:25 AM, he/she will need to come to the office to sign-in. Students will be recognized for their attendance. We will be sending all regular weekly communications home in Friday Folders. Please be sure to check the contents of the folder each week, sign that you have viewed them, and then return the folder promptly on Monday. From the Healthroom . . . It is recommended that children with the following symptoms need to stay home for 24 hours after these symptoms are resolved, unless a note from the family physician states that the student can attend school. According to Kansas State Statutes, children who have medications to take at school need to have them kept in the Nurse’s office and not with the child. Especially in elementary, medications are to be kept in a locked cabinet at all times for the safety of your child and other children at the school. If you are sending medications to the health room via your child, please call the Health aid to let her know they are on the way and can take them from your child before school starts. Thank you for your help in this matter. Are interested in becoming a teacher helper, tutor, field trip monitor, room parent, etc. Call your school office to become a School Volunteer. If you do not want USD 261 to disclose directory information from your child’s education records, you must notify the District in writing within two weeks of enrolling your child. Please send such notification to: Liz Hames, Community Relations Coordinator, 1745 W. Grand, Haysville, KS 67060 AND to your child’s school. If a written notification of refusal to release directory information is not received by the District, USD 261 assumes there is no objection to the release of the directory information as designated. Each school has a Learning Facilitator (LF), who monitors the Literacy First process. During this process, teachers learn and apply new research-based strategies for teaching, student engagement, and monitoring the individual learning of all students. Literacy First has changed how we teach reading, as many of the strategies are applied during math, social studies, science, etc. "Rex School is a Bully-Free Zone"
Rex students and staff work very hard to make our school a bully-free place. At Rex our definition of bullying behavior is behavior that is unfair, has an imbalance of power, is hurtful, is done on purpose, and is repeated. This includes physical, verbal, social, emotional, or cyber bullying. "If you have a kid's heart...you have a child's mind." Our teachers and staff are practicing the strategies of "Capturing Kids Hearts" to transform our classrooms into high-achieving centers of learning. By implementing these strategies we are experiencing fewer tardies, higher attendance, lower discipline referrals, fewer dropouts, and increased graduation rates.